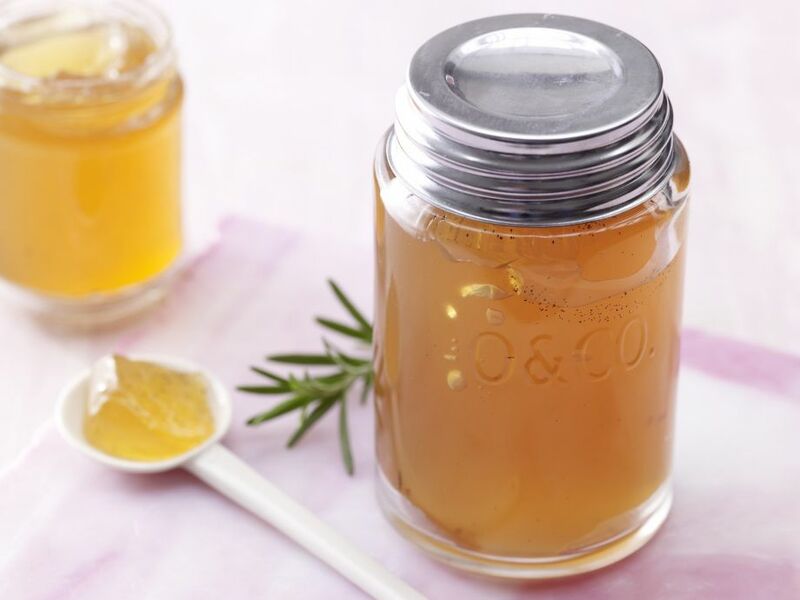 Apple-Rosemary Jelly - Here herbal and sweet meet - how clever! 1 Rinse the screw-top jars with lids (they should have a total capacity of 800 ml) (approximately 3 1/2 cups total capacity) in a pot of boiling water and then let drain upside down on a kitchen towel. 2 Squeeze out the lemon juice. 3 Halve the vanilla bean lengthwise and scrape out the seeds. 4 Combine the lemon juice, vanilla seeds and apple juice with the jam sugar in a pot. 5 Rinse the rosemary, shake dry and add to pot along with the vanilla bean. 6 Bring mixture to a boil and cook while stirring over high heat until bubbling, 5-7 minutes. 7 Test setting point by placing a few drops of the liquid on a small plate. It should begin to set after a few seconds. If so, then it is ready to be placed in jars. If not, cook for another 1-2 minutes and repeat the test. 8 Remove vanilla bean and rosemary from pot. Pour the hot mixture through a funnel into the prepared jars.